The William Secord Gallery is pleased to present the work of Christine Merrill, an internationally acclaimed artist, whose portraits of our beloved pets enrich the lives of collectors around the world. 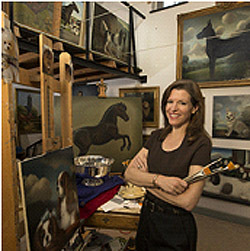 Click on the photo above, of the artist at her easel, and enter Christine Merrill's world, with information about the artist, how to commission a portrait, or purchase a fine painting. Read about her rise to national acclaim to become America's finest painter of dogs. Please click on the image above to begin. The William Secord Gallery, Inc.